I still don’t recommend Windows 10. I’ll be staying with Windows 7 for as long as possible (at least until January of 2020, when Microsoft will no longer offer security updates for it). But I know there are some people that are concerned that someday they might HAVE to upgrade, and the deadline for getting the FREE upgrade to Windows 10 is July 29 – just a couple of months away. It would be silly to pay for Windows 10 (which will probably be $119) if you could have gotten it for free, right? Windows 10 was first introduced at the end of July, 2015. For anyone that has Windows 7, Windows 8, or Windows 8.1, the upgrade to Windows 10 is free if you do it by July 29, 2016. 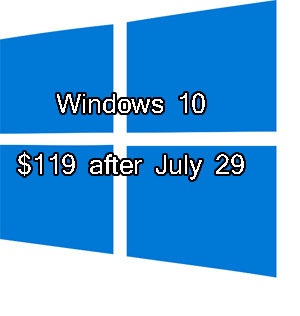 After July 29, if you want to upgrade to Windows 10, it will cost you $119. But there’s a way around that, if you’re concerned about it. Disclaimer: As a general rule, I don’t recommend that the “novice” computer user should do either one of these things. It’s true that if you know all the steps involved, and you’re familiar with how the system image software works, you could probably do either of these successfully. But we’re talking about your computer’s operating system here. If something goes wrong, or you’re presented with an error message or an option that you aren’t familiar with, you’re might be kind of stuck in a difficult place. I’m only presenting this today for the users that are considering doing the upgrade now specifically to avoid having to spend $119 later. Actually there are two ways to keep using Windows 7, but get Windows 10 free even after the deadline. There are pros and cons to both. Of the two methods, this is the easier one – but it’s not 100% guaranteed. Windows 10 has a built-in process that allows you to go back to your previous version of Windows, if you decide you don’t like Windows 10 or it doesn’t work properly (both are likely scenarios). But you have to do the rollback within 30 days of the upgrade. And here’s the catch: that rollback option has been known not to work on some computers. And it can make a difference if you do it 1 day after the upgrade, or 29 days after; whatever work you’ve done during the Windows 10 period will likely be lost when you go back to Windows 7 or 8. Use Macrium Reflect to create a system image backup of your entire hard drive. Macrium Reflect can be downloaded free for personal use here. That system image should be stored on an external/portable drive. Also, be sure to create the Rescue Media disc when the program prompts you to do so. When it’s finished, disconnect the portable drive from the computer. Go through the Windows 10 upgrade process. If you have the Windows 10 nag icon in the lower right corner, you can click that to do it. Otherwise, you can go to Microsoft.com and you’ll be bombarded with messages to get that upgrade. (Note: if the Windows 10 upgrade has already been disabled on your computer through a program such as GWX Control Panel, or Never10, you will need to open that program an re-enable the upgrade ability.) After the upgrade is fully done, restart the computer and make sure it boots up to the newly-installed Windows 10. Maybe you’ll want to click the “Start” button and browse for a while just to cement the fact that you don’t really like Windows 10. Now do the rollback to your previous version of Windows. I’ve done a full blog post about this, which you can see here. If the rollback doesn’t work for some reason, you still have your system image that we created in step 1, so you should be able to re-install Windows 7 or 8 from that. This one is the more reliable of the two methods – but not quite as simple. It’s only more reliable due to the fact that the “rollback process” built into Windows 10 just doesn’t always work properly. As you can see, the software we use for this is the same as we used in Method #1 – Macrium Reflect. It’s very reliable and I love it. Personally, I bought the paid version just to support the developers (and in case I ever need their tech support, which is not included in the free version). Use Macrium Reflect to create a system image backup of your entire hard drive. Macrium Reflect can be downloaded free for personal use here. That system image should be stored on an external/portable drive. Also, be sure to create the Rescue Media disc when the program prompts you to do so. Go through the Windows 10 upgrade process. If you have the Windows 10 nag icon in the lower right corner, you can click that to do it. Otherwise, you can go to Microsoft.com and you’ll be bombarded with messages to get that upgrade. (Note: if the Windows 10 upgrade has already been disabled on your computer through a program such as GWX Control Panel, or Never10, you will need to open that program an re-enable the upgrade ability.) After the upgrade is fully done, restart the computer and make sure it boots up to the newly-installed Windows 10. Put in the Macrium Reflect Rescue Media disc that you created in step 1, and boot the computer up to that disc. With the portable drive connected, restore the system image that you created in step 1. When that is finished, your computer should be back in the same state it was in before you did any of this (in other words, it is back to Windows 7 or 8). The big question: why does this work? You might read the steps in these processes and wonder, “What does this actually accomplish?” And that’s a valid question. I mean, you’re basically just upgrading to Windows 10 and then going back to what you have now. Here’s the key: when the upgrade to Windows 10 happens, Microsoft makes a note of it on their end. You don’t have to enter a product key or go through any manual activation process – it all happens in the background. This is called a “digital entitlement”. This just means that Microsoft knows that your specific, unique computer is eligible for Windows 10. And that status stays on Microsoft’s records – EVEN IF you then go back to using Windows 7 or 8. By doing the upgrade, you’re kind of “reserving your place” so that if you ever want to actually upgrade and start using Windows 10 in the future, you’ll be able to do that without having to purchase it. I’ll probably do this on my own computers, and on my wife’s computer, just to be covered for the possibility that someday we might somehow be forced to upgrade to Windows 10. But as I said earlier, Windows 7 will be supported through January 2020 – and who knows what the Windows situation will look like in 3 1/2 years. I happen to run Linux, not Windows. For those who run Windows 7 (or 8) without having a proper license key, i.e. their Windows installation is bootleg, will the upgrade to Windows 10 still work properly? I have found only 1 program I cannot replace with a Linux version. I have now made the switch entirely and have not regretted the change. Not sure what would happen with upgrading that kind of Windows installation. I’ve heard information going both ways on that. Glad Linux is working for you though. It’s just not a viable option for everyone. Hi, Scott – first time listener. Nice write-up/podcast. I was already familiar with both options discussed for getting registered for Windows 10, but my biggest take-away from this episode was Macrium Reflect. I am downloading/installing it now – looks like a great option, thanks for mentioning it in this episode. Looking forward to listening to your previous podcast episodes and future ones. Oh yeah, I love Macrium Reflect. It has saved me and several of my clients.